Does the world need yet another sequencer / synth / guitar album? 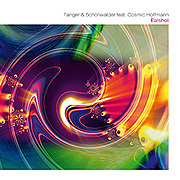 Listening to Earshot (46'19") by Fanger & Schonwalder featuring: Cosmic Hoffmann the answer is definitely, "Yes". Seduced by the trio's use of rhythm, harmony and melody - fans will find that this music is blessedly a cut above what others in this genre are putting out. The clear influence here is the music of Tangerine Dream from the 1980s. A not so obvious connection is to The Nightcrawlers, another Spacemusic trio who also created significant work in this realm - out of their modest South Jersey garage during the same period. The atmosphere of this music is one that calls attention to a vision of a world transformed by technology. Mellotron string pads swell and expand above skipping TR-808 rhythms. Later an electro voice introduces sweeping phase shifted chords amidst dancing sequencer patterns. Earshot's arranging and sonic organization is top notch, especially the opening studio track. The warm beats and bassline provide a propulsive element with enough power and energy to support the upcoming melody. And it is here that Cosmic Hoffman's heroic guitar leads become so distinguishing. With just the right amount of distortion, echo, and who-knows-what-else, Hoffmann turns a series of well-placed plucked strings into writhing liquid lead lines - with enough force to drag the listener into interstellar space. Earshot opens up a wonder chamber of spacey sounds and cosmic bliss whereever it is played. Although the work of Fanger/Schonwalder/Hoffmann may be compared to earlier works by innovators great and small, every gesture on Earshot, no matter the size or scale, feels uniquely and naturally theirs.